Design of new facilities for a medical research institution. The RiMed Research centre specialises in general research into cancer and transplants for cancer patients. The new site is located at the foot of a mountain with the sea on the other side. For researchers, the dual and sometimes opposing factors of privacy and communication are key factors in their work. 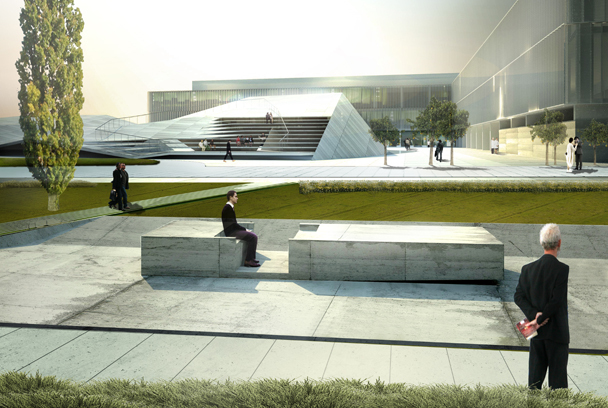 The design is planned around a central plaza with an L-shaped building around the sides opening up to the sea view. The interconnected labs and offices located in this building are interspersed with communal areas and outside there are plenty of benches giving ample opportunity for both formal and informal interaction. Of the two sculptural buildings in the plaza, one is an auditorium and the other houses a restaurant and other services.